Charcuterie is an art that rewards patience. Brining, curing, smoking, pickling: all of these things take time, but the final results are unlike anything you can whip up in a few hours in the kitchen. Charcuterie also demands planning and consideration of ingredient seasonality. If you think far enough ahead about what and when you want to eat, you can create a rolling schedule of meals based on what comes out of the smoker, curing cabinet, fermenting crock, or refrigerator. 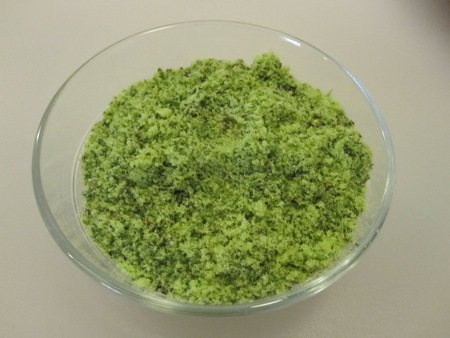 I had eight legs ready, along with a half cup of kosher salt, two bay leaves, two tablespoons of chopped thyme, a quarter cup of parsley leaves, and a teaspoon of black peppercorns. 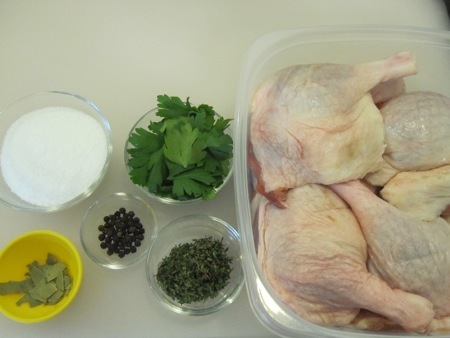 I rubbed the legs with the salt (about a tablespoon per leg), packed them into a baking dish, covered the dish with plastic wrap, and let it sit in the fridge for 24 hours. The next day the legs had darkened and firmed up a bit, leaving some liquid in the bottom of the dish. 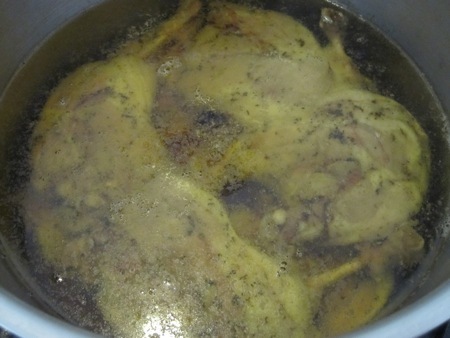 I rinsed and dried the legs, packed them two layers deep into a medium pot, and covered them with melted duck fat. After ten hours in a 190°F oven, the legs were tender. 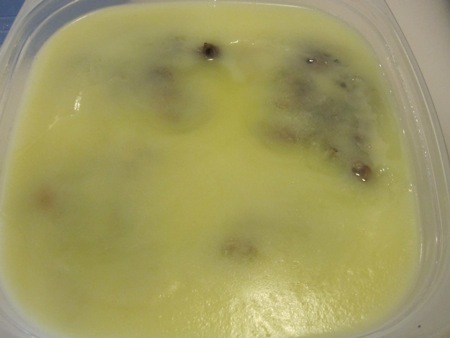 I let the legs and fat cool, then removed the legs to a new container while I strained the fat and let it settle. See that pink layer below the fat? That’s the meat juices and rendered collagen, a culinary treasure. 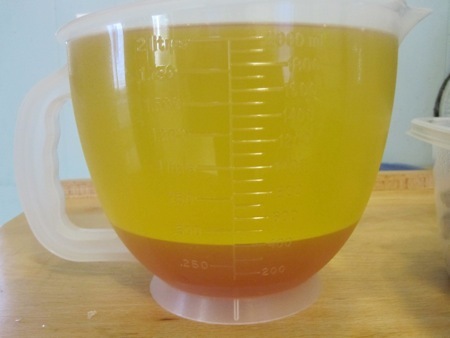 I poured clarified fat from the top layer into the container holding the legs, covering them by about a half inch. 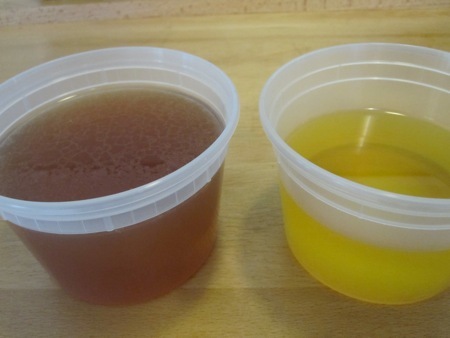 I decanted the remaining fat and the confit jelly into separate containers. 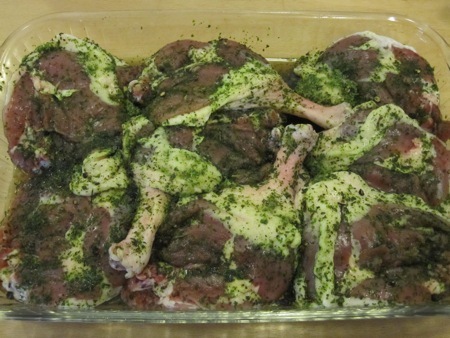 I took the duck legs out of the fridge and let them come up to room temperature, which would let me remove the legs from the fat without tearing the meat. While I waited, I made two other confits: onion and garlic, both from Bouchon recipes. 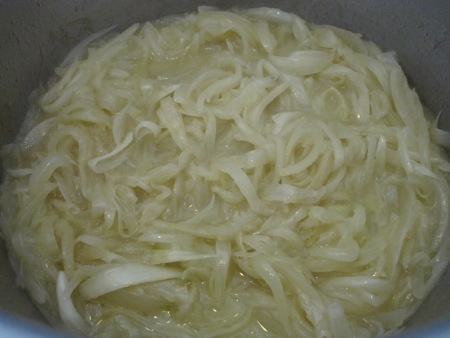 The onion “confit” is actually an onion soubise, cooked low and slow with butter until the onions are soft but not browned. 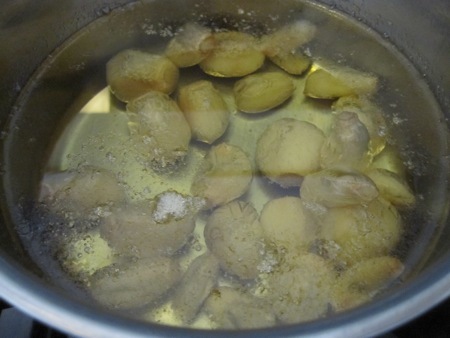 The garlic is cooked in oil over low heat for about an hour, until the cloves have softened. The recipe yields were more than I needed, so I stored the extra onions and garlic in the fridge. I bottled the excess garlic oil, which I will use for sautéing and vinaigrettes. 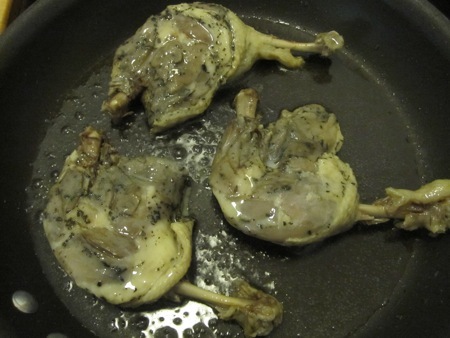 I reheated the duck legs, skin side down, over medium heat until the skin was browned. I spooned some of the fat from the pan into a baking dish, added the legs skin side up, and put the dish in a 375°F oven for about eight minutes to heat through. 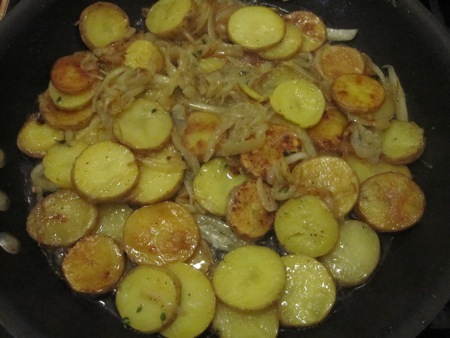 While the legs cooked, I made Lyonnaise potatoes: sliced fingerling potatoes cooked in duck fat with the onion confit. 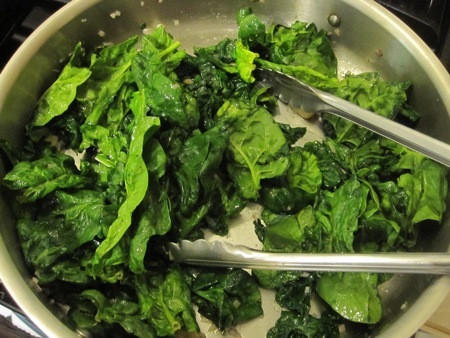 Juggling a third pan, I made sautéed spinach with garlic confit, adding a dollop of the confit jelly as seasoning. This entry was posted in food & cooking and tagged charcuterie, cooking, food. Bookmark the permalink. 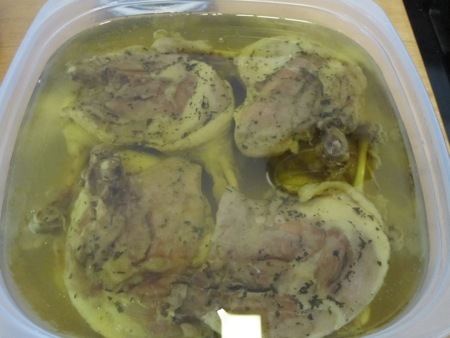 Are you going to get botulism from the garlic oil? I am irrationally terrified of preserving garlic, but maybe since it’s cooked…? My unscientific response would be “I’m still alive after years of using homemade garlic oil.” My scientific response would be the garlic was cooked at sufficiently high temperatures for a sufficiently long time to kill any bacteria. In addition, I only use the oil in hot cooking applications. 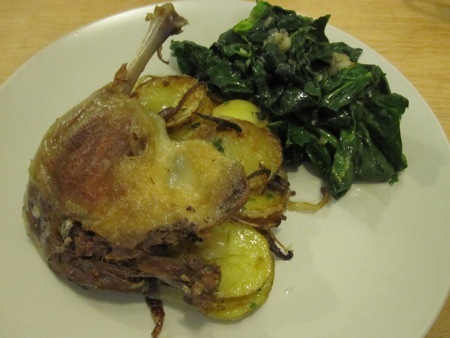 It’s difficult to screw up confit. Be sure to separate out the meat juices from the fat, handle everything with clean hands, and let it sit for a few weeks. Interesting blog you have there, describing an activity that is completely foreign to this city-raised New Englander. Fair enough. I’m still alive after all the uncooked eggs I consume. I’m pretty sure I worry too much about the tiny risk of botulism. I make confit 2-3 times a year, and I just discovered chicken rillettes. 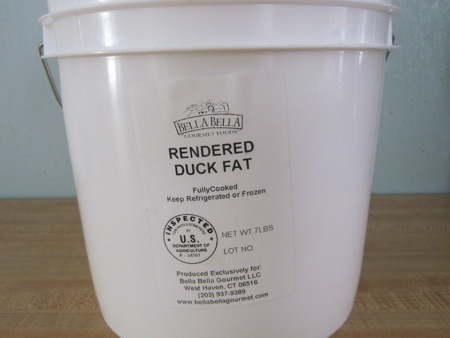 I picked up a duck for confit and thought about picking up a chicken for rillettes and inspiration struck. I think I’ll save back a duck leg and eat it confited and shred all the rest.